Yesterday the Board of Inquiry (BOI) released their draft decision to approve the Northern Corridor project. This is the project that will upgrade the last section of SH18 to a motorway and provide a motorway to motorway interchange with SH1. More importantly for us though, it includes a long awaited extension of the Northern Busway from Constellation Dr through to Albany. An independent board of inquiry appointed to consider an application by the New Zealand Transport Agency, has given its approval to the Auckland-based Northern Corridor Improvements proposal, part of the Government’s accelerated programme of works. The approval gives the green light to construction of the last link of Auckland’s Western Ring Route, providing an alternative route from South Auckland to the North Shore. 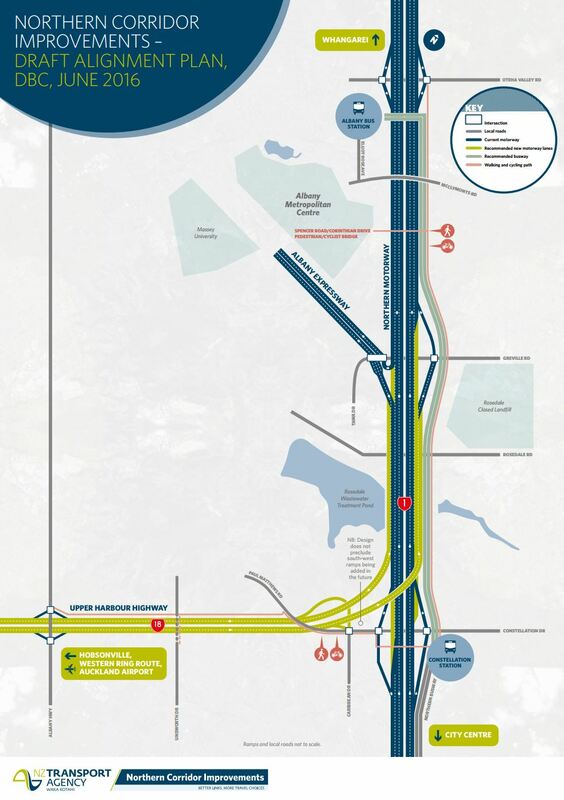 The new road will create an uninterrupted motorway-to-motorway connection along the Western Ring Route – the Hobsonville, Northwestern and Southwestern Motorways (SHs18, 16 and 20) – between Albany and Manukau to the south, upgrading the Upper Harbour Highway to a motorway, and extending the Northern Busway from Constellation to the Albany park-and-ride station. The New Zealand Transport Agency, Auckland Council, landowners and occupiers affected by the decision, submitters, and the Minister for the Environment, now have 20 working days to provide minor or technical comment to the draft decision document. The Final decision will be released by the Board of Inquiry on the EPA website in November 2017. The process has been going on some time, concurrent to the same process for the East-West Link but is a project that has far less opposition due to its multi-modal nature. Although it should be noted that wasn’t always the case as when the government originally announced, then transport minister Gerry Brownlee specifically excluded the busway despite officials saying it was needed. That the busway is included is hugely positive and will represent the first major PT project in Auckland the government have will initiated. The NZTA are understandably pleased with the result and note that they hope to start construction in 2018. I haven’t been through the full report but have skimmed a few sections of it and the conditions, here are a few interesting things I noted. Perhaps the NZTA could avoid all that altogether by building the busway first. That could presumably be done with relatively minimal impact to the motorway and provide a viable alternative for many more people while the motorway works take place. The report does note that “the indicative work programme reveals that the Busway will be constructed at an early stage in the Project“. The future-proofing of the Busway is incorporated in the design as there remains scope for a future station at Rosedale, and the possibility of extending the Busway further north from Oteha Valley Road is retained. Also, the Transport Agency appears to be firm in its desire to maintain a maximum gradient on the Busway of 5% (subject to detailed design) in order to provide for the efficient operation of the present bus fleet and the possibility of light rail in future. opposed for the reason that the SUP on SH1 will compromise any future increase in the provision for general traffic. Any readers up for a challenge could read his whole submission to the BOI. Incorporating a better cycling / walking link to Albany Station would have been useful too. Great to see an actual multi-modal project at the strategic level at last: Motorway upgrade, full separate Rapid Transit way, and walking and cycling. Plans matching PR, finally. Yet so frustrating looking at that schematic with the Busway routes and thinking what the NW should always have been…. So we look forward to this being the base line, the standard, the minimum. And occurring where there isn’t already an operating Rapid Transit in place to extend. And, more importantly, the missing modes being added without requiring massive motorway upsizing as well (Eastern Busway!). Because to make Auckland a truly multi-modal city the current imbalance can only be corrected by adding the missing modes ahead of further road expansions. ahead of? instead of? or by adding the missing modes through road reallocation? You are correct. NZTA believe their own hype that the western ring route is a bypass for trucks around Auckland… rather than the reality that it’s mostly used by single occupant commuters. Huh. You’d think if they’re going to spend a bunch of money on a new bit of road they could at least do it properly. Oh, who am I kidding? The would need to spend a whole bunch more to build a much bigger interchange to do all the links. And the traffic will just be sitting all but stationary on a new bridge rather than on Constellation-SH18 as per now. NZTA do not want to do this until their is a second harbor crossing. Their arguments being that the motorway south is already at peak capacity and having a direct west/south link rather than controlled access via the constellation on ramp will lead to gridlock. They also say that west/sth will be improved as currently west/nth traffic shares upper harbour highway with vehicles going sth and they will be removed. Yes it will be fine with the removal of that west to north & visa versa traffic removed from the light controlled intersections. — Encouraging people travelling to the city to use public transport. I think those are good aims. Many of those people your husband notes will be the bus in the future, so no point spending hundreds of millions facilitating a movement that would cause a lot of problems for everyone on SH1. Agree entirely. 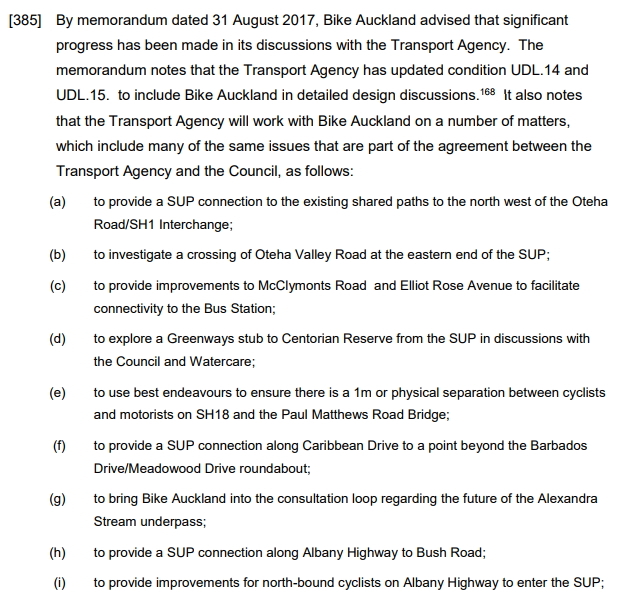 And this is supported by checking Google traffic every week day morning where you will see that the ramps from SH 20 (Waterview Tunnel) have priority joining SH16 heading into city and create delays for those already on SH16. In other words the Western Ring Route is best as just that; a bypass of city and its inner motorways. Yes, I can see all that. I forgot to take into account the extra land required for a giant interchange. Good job I’m not a planner. Hopefully with a proper busway local residents will see PT as a viable alternative to driving, even during the daytime so that turn won’t be so well used. With double digit growth, I think people have well cottoned onto this. yes, you have highlighted an important issue though: What is the provision for buses running on an east-west alignment through the interchange to access Constellation Station? This connection to the busway is crucial for people living in the upper harbour area. This is an important note when we think of any SH18 – Westgate to Constellation transit line. Whilst I can understand that they’re trying to direct traffic onto SH18, I agree that if you’re heading to the CBD this is going to be an interesting piece of road! To play devils advocate, the diagram already suggests some impressive concrete dinosaurs to funnel traffic onto SH18 (as well as allowing traffic onto Paul Matthews) – I couldn’t imagine them having room to build an interchange to manage SH18->SH1 Southbound without either a very high, large and tight banking offramp over the busway and businesses, or building an even more massive structure on the currently vacant land to the north. the design allows for the west sth link but as you describe NZTA freely admit their are massive design challenges – last I spoke to them there was talk of a tunnel of some sort but it’s al speculation as it is decades away. Finally getting a pedestrian link from Unsworth to Paul Matthews is well overdue. Currently their is none. People wanting to walk east of Caribbean to the industrial estate have to walk along the grass verge – not pleasant in winter and there are a lot of them that do this, both residents of Unsworth and people from Constellation Stn. A route which is circuitous for many and has incredibly poor CPTED outcomes. It would be nice if there was a bit less of a dog-leg going into Albany Station. While it would cost more now to build a curving bridge it will be worth it in the future if it is part of an LR line to Orewa. It’s ok, there is a possibility that the busway will continue on the eastern side past Albany, so for buses it is easier to do a turn, for light rail, this might be a little different. It all depends on where the next extension goes. I would have thought the easiest thing would be to link the busway to the McCylmont’s Road bridge, which is only a couple hundred metres from the station and requires no doubling back. You could probably run through there quite happily for a long time, and leave the decision on a separate busway bridge for when you make the decisions around how, where and when you take it futher north. In Manchester there are a couple of places on the tram line to Eccles where the rails do a pretty tight turn. The trams seem to manage so it is not a deal breaker to have tight turns on the busway that later can become light rail. I agree it is possible but it will slow the trams down in the future, we would never accept that sort of corner on a motorway so why on the rapid transit network? I suggest we’ll have to rebuild that piece if / when we go the LRT option. +1, that’s probably the better outcome too. LRT is going to be a completely different alignment through there. I find it interesting that the bottom label is city centre and the top label is Whangarei, it’s almost as if the agency expect that there will be a motorway all the way to Whangarei at some day. If David Willmott was interested in managing scarce resources, wouldn’t he want to stop the waste of rural motorways? No, because his homepage says: ‘As Chinese engineer Zhang Peng told the BBC’s Joanna Jolly, quoting an old Chinese proverb: ‘To get rich, build roads first’.’ Building roads isn’t a waste of scarce resources; that’s money spent on getting rich. I actually took some time out to read CUTS/David Wilmott’s submission. I read someone say that the new Blade Runner movie made them question the very basis of their own existence. I feel like that submission did the same for me. Talk about going down the rabbit hole. a motorway to whangerei (and probably taupo) is plainly steven joyces expectation. And will make no one except those building it rich. And the rest of us a lot poorer. So this one really really finishes the Western Ring Route? No they have left out the SH18 to SH1 south connections. It only becomes a ring route once they build those. It the meantime it is only a bypass. I am not sure there was less opposition because it includes a busway. More likely there was less opposition because it doesn’t involve a massive 1970’s style destruction of a estuary environment. What, people care less about impacts on a garbage tip and a sewerage treatment plant? Actually Willmott had a gripe about the hockey fields being reconfigured. Classic NIMBY, in the same breath argued that nothing should every come in the way of building an even wider motorway with full interchange immediately… except the hockey fields where he coaches on the weekend. I’ve been told hockey will have to move completely. the original plan impinged on the treatment ponds but watercare talked NZTA out of it. Hockey will move to Bush Rd where the pony club and BMX track currently is. Getting out of the business park on evenings when the hockey is on will become even more of a nightmare. Before we start looking at the productivity costs during construction. The ponds aren’t still used are they? That is 18th century technology. I thought they had biofilters there and activated sludge and all that stuff. Well, this is NZ. Nobody cares. We have plenty of environment so it doesn’t matter if we pollute a bit. We’re still throwing used batteries in the landfill for example. In fairness our hockey doesn’t have the added costs of keeping its playing surface below freezing at all times! 🙂 Sprung. Well, at least we’ll be able to afford ice hockey as well once we’ve become rich from building all these roads. So what is the chance of an Onewa Rd busway station been built in the future? No they asked some babyboomers if they wanted it and they said no. This. All three of them, oh and they’re same ones that believe western civilisation is imperilled by SkyPath… poor dears. Yes, I’m sure it can be revisited & have more support. This site has achieved a lot in terms of raising awareness and promoting alternatives. Snide posturing merely allows proper discourse to be dismissed. ‘waiting for the AWHC’ for a bus station at Onewa is absurd. Totally unrelated. Anyway, the bus station will be useful, whereas currently configured, the road crossing AWHC is a disaster and un-fundable, as ATAP has shown . +1 to Patrick. Waiting for the AWHC basically means not happening. The Onewa Road Station should wait for the AWHC in my opinion. But it would be ten years away and rail only. I’m not so sure that there’s anything that is classic NIMBY about this. The hockey facility is the second largest in NZ, serves half of the Auckland region and is an international facility for a growing Olympic sport. It is used seven days a week for virtually the whole year, making it in many ways a more important sporting asset than say Eden Park. It concerns me that we are talking about demolishing and rebuilding this in our pursuit of ever grander motorway schemes. Just how bottomless is the bucket of road-building money? And a wider concern is how government agencies seem to think that our green spaces are fair game for upgrading to tarmac and concrete. Who will protect our public spaces if we can’t rely on our various elected government agencies to do so? The nimby factor is that Willmott is so extremely vocal about bashing new motorways through everywhere, and so vocal about not letting petty local issues stop that… except in this case where it personally affects him rather than other people. So he is all in favour of huge new motorways everywhere else except where it impacts him personally. That is the very definition of nimby. This is concern trolling and it really detracts from the rest of your statement. The entire facility is being rebuilt just down the road. Is the new hockey facility in easy walking distance of regular public transport? Most of Albany Stations catchment is to the east, not the west. We need to sort Oteha Valley Road up to Northcross and a route through to East Coast Road using the McClymonts Road Bridge. I am aware that is going on and the street design there looks ok. Unfortunately, the entire remainder of that route is terrifying on a bike. Haha, guilty. I drive down to Albany from Silverdale because I can still get a car park at 7am. Hopefully NZTA will learn from the relatively successful progressing of this project and take another look at the scope of EW link.